In the neverending debate between head and heart, I declare, “No contest!” Well, to be fair…I declare there is no debate or fight. They can’t be separated. Mostly we think of heart representing feelings and emotions. Those reside in your head. Your brain. They’re formed based on what you think and believe. Debate over! To assume that logical and rational thought are disconnected from emotions and feelings is to assume you can have Spock-like qualities. You’re neither completely logical or emotional. You’re a confluence of them both. Sometimes one tips heavier on the scales than the other. It happens. As a small business owner, you serve your employees. First and foremost, they’re the “customers” you must effectively serve. They’ve got feelings, emotions, thoughts, beliefs, and ambitions. Which is why you must lead with your heart. Empathy is defined as the ability to understand and share the feelings of another. First, it’s understanding. Second, it’s sharing (based on understanding). Think about the last time you were angry, frustrated or annoyed. Maybe it was 5 seconds ago. Maybe 5 minutes ago. Doesn’t matter. Remember what happened? Think about it. Hold that thought. Did it impact your behavior in any way? Of course, it did. Maybe you snapped at somebody who hadn’t done anything to deserve it. Maybe you closed your door and threw papers. You reacted by doing or saying something. Or, you sat there stewing about it. It affected your performance. But feelings and emotions don’t matter, right? You own the place and thoughts, feelings and emotions drive your performance. Don’t you think they drive the performance of your employees? Question: What are the professional and personal goals of your top 3 employees? Most business owners may say, “I have no idea. It doesn’t matter.” But it does matter. Convince yourself that the only thing that matters is what YOU need those employees to do, and you’re blowing it as a leader. Miserably. You’re making sure your people know you don’t really care about them. It’s not about them. It’s about you. Yet you expect them to perform at the highest levels possible. You’ve lost your mind. Now you’re working on losing your employees. Try leading with your heart. Let me give you a specific action you can take today. Yep, today’s Friday. It’ll be a great way to wind down the week. Don’t put it off. Don’t wait until next week. Got a conference room or someplace private where you can meet employees one-on-one? Unless you’ve got an office where you can sit by the employee without your desk being between you, then avoid your office. Sit side by side with the employee. Like two friends having a conversation. Got 20 employees? 50? 100? The more employees you’ve got the longer this is gonna take. Schedule accordingly. Map out a strategy that is least disruptive to the work. Carve out 10 minutes with each employee. Just you and the employee. They’ll panic if you’ve never done this before. That’s normal. Don’t sweat it. They’ll realize what’s going on within the first few seconds. Schedule as many as you can. Twenty employees will take you a little over 3 hours. Easily done in a day. Figure it out. Greet them when they walk in as you would a friend. Stand up, shake their hand and welcome them. Tell them you’ve decided to periodically spend a few minutes with every employee to find out more about them. Don’t make this time about you. It’s about them. You’re their servant. You want what’s best for them. You must get that across if this is going to be impactful. Over the course of the next few minutes, you’re hoping to find out how they’re doing. What’s their goal? What do they want to achieve over the rest of the year? Are their things happening that frustrate them? Are these things you can remedy? You must make them know how much you care, and how dedicated you are to help them succeed. Stay on time. As they leave, remind them they can contact you at will. Encourage them. Cheer them on. THANK them. Make leading with your heart a habit and you’ll improve quickly. You’ll also become quickly convinced that you should have done this a long time ago because you’ll notice a positive difference in performance. If you called me up right now and shared your frustrations, aspirations and dreams…we’d have a productive conversation about it. I’d ask you some questions. You’d share more. I’d ask a few more questions. You’d be figuring some things out during our talk. I’d challenge you in the best ways to achieve what you want. Not what I want because it’s your life, not mine. You’d leave our conversation energized, uplifted and more firmly believing in yourself. I’d make sure of it. It’s what I do with CEOs, business owners and leaders. 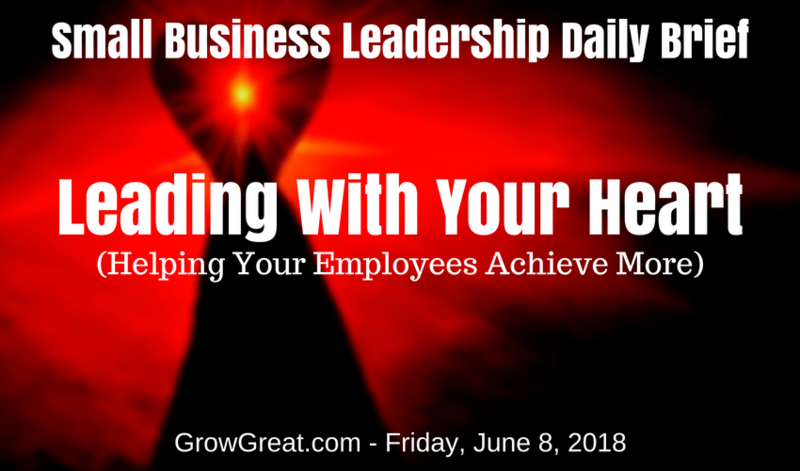 You need to start making sure you’re doing that for your employees.